Collier Research Corp.’s HyperSizer, other CAD platforms help bring small, low-cost, modular, off-the-shelf commercial spacecraft to life. The Ames Common Bus took its first flight-program shape in 2008 as the Lunar Atmosphere Dust Environment Explorer, or LADEE. This small spacecraft—which is scheduled to launch in 2013 and fly in low orbit around the moon—will analyze lunar atmospheric dust. To design LADEE using the Common Bus approach, engineers used several design software packages and finite element solvers, including ProEngineer CAD with Windchill, MINX and ProMechanica, supplied by PTC (Needham, Mass., USA), Patran from MSC.Software (Santa Ana, Calif.) for the master finite element model (FEM), and NASTRAN, also from MSC, as the workhorse finite element analysis (FEA) solver. Fernandez added HyperSizer, a structural sizing and optimization package for composites and metals, from Collier Research Corp. (Newport News, Va., USA). “HyperSizer is a robust analysis tool that interfaces and iterates seamlessly with NASTRAN, and helped us minimized structural weight,” he says. Each Common Bus module is octagonal in shape, approximately 14 inches tall by 46 inches across, comprised of two face sheets and a honeycomb core. Common bolt patterns on the top and bottom of the structure allow them to be stacked or interchanged like LEGOs. 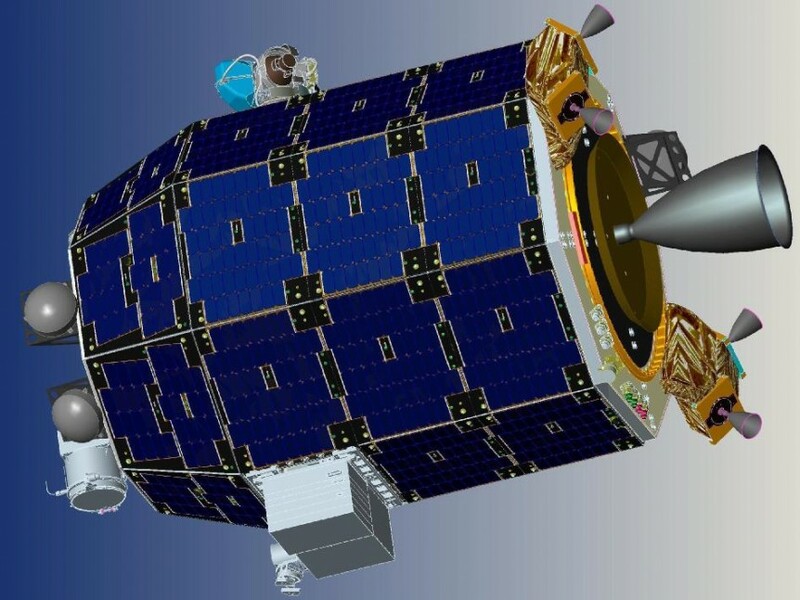 For the LADEE project vehicle, four modules would be stacked, with the two bottom modules for the propulsion system and the two top tiers for instruments. Solar panels would be mounted around the sides of the modules. But, design modifications were necessary to customize the vehicle, including trimming away decks and/or walls to make room for internal equipment, and adding inserts for additional equipment attachment points. Early in design, the engineering group employed HyperSizer to perform rapid and extensive trade studies on the vehicle using the software’s extensive material property database, to optimize the materials and needed modifications. Once the team arrived at a working design, the fidelity of the finite element model was sharpened by using HyperSizer to calculate detailed element-by-element margins of safety for each of the many applicable failure modes — for LADEE, approximately 500,000 shell elements were subjected to nearly 100 global load cases. On average about 20 failure modes—including core shear, flatwise tension, face dimpling, local buckling, and interactions—were checked for each element, depending on type. Then, HyperSizer verified the performance of both the composite structures and metal interfaces and bracketry. “In a full run, the software calculated and sifted through about one billion margins for the model,” says Fernandez. “HyperSizer was critically important to organize and present this staggering amount of data.” He adds that if these analyses had been done manually, the simplified iterations would have resulted in an overweight design, counter to strength and weight goals. HyperSizer provided other benefits as well. During critical design review (CDR), for instance, Fernandez was able to produce graphical outputs that clearly illustrated structural margins, critical load cases, and critical failure modes. He could easily verify and record a multitude of element properties ranging from input loads to material and construction types. The tool generated a stress report that became part of the final Primary Structure Stress Substantiation Report. And during fabrication, HyperSizer helped the team disposition non-conformances by allowing engineers to quickly assess the impacts of fabrication imperfections based on margins in those areas. “HyperSizer increased the efficiency of the team, enabling us to complete the analysis in far less time,” says Fernandez. The LADEE spacecraft uses prepreg made with T300 and M55J carbon fibers in a TenCate Advanced Composites USA Inc. (Morgan Hill, Calif., USA) RS-3C resin, with M55J used only in those areas in which stiffness is needed to maintain first-mode frequency requirements. All panels incorporate an aluminum honeycomb core, with an aluminum-faced panel for the heat-rejecting radiator. There are also various hard points for interfaces, bracketry for mounting components, and connection fittings between panels. Panel-to-panel interface fittings are bonded machined titanium, since their larger size prevents the use of lighter aluminum. When assembled, LADEE’s four-module skeleton (without instrumentation) weighs only 102 lb/46.3 kg. Of that total, 70 percent is composite-faced panels, five percent aluminum-faced panels, and 25 percent a combination of metallic inserts, fittings, and brackets. Once the scientific payload has been added in, the craft still weighs only 286 lb/129.7 kg — light for a satellite. At launch, it will be about 800 lb/363 kg wet mass.